She is a people pleaser. When someone asks her a favor, she is eager to help. She feels insecure, unappreciated, and by doing stuff for others, she builds her self-esteem. But people ask her different things, sometimes contradictory ones. So she has developed a split personality, showing different face to different people. Some accuse her of being manipulative and dishonest, but all she wants is to be liked by everyone. What has this psycho-babble have to do with software? More than you might think. Customers ask as for new functions all the time. Whenever possible, we try to add them. Hey, it is just another button. Problem is, that by making one customer happy, we might alienate hundreds of others. One customer wanted us to replace weft yarn letters a, b, c, d, e, f, g… with Roman numbers I. II. III. IV, V. VI. VII. … The person who never worked in another factory, told us that everyone works like that. Oh well… We ended up adding it as an option in HTML printout. Over the course of 20 years of development, we have accumulated a fair amount of features needed by only a handful of customers. But those customers who need them, can’t live without them. This is called feature creep in software engineering, and it is a sign of bad design. Of course, everyone likes to play the Steve Jobs card: keep the essential, and cut off the rest. 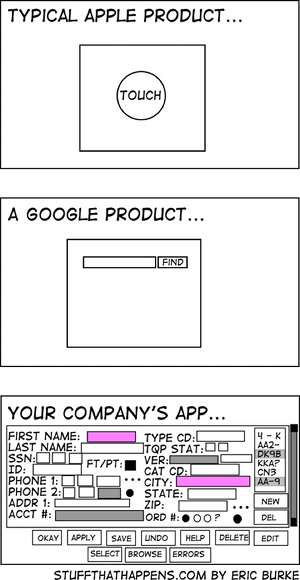 The concept is well illustrated in the famous cartoon by Eric Burke, which compares Apple, Google and our product. By dumbing down the product, you make it appealing to the general public. But weaving CAD is not for everyone, we don’t target average Joe. If you are not prepared to learn the meaning of warp, weft and yarn count, you can’t design fabrics. Our customers are competent woven designers. Still, this is no excuse to flood their visual system with fifty buttons on every window. We want to make the program simple for beginners, with all the basic functions without much distraction. And also offer all the advanced functions for customers, who can handle them. Our solution is similar to split personality – ArahWeave 7.0p will show different user interface to different users, depending on program mode. Program Mode menu offers you the choice between Simplified, Normal, Expert and Server mode. – Simplified mode is for beginners, it is the default mode in demo version of the program. It will hide most of the complex, hard to understand features, and keep the essential. For example, beginner probably won’t make fabric with dual weft insertion, two warp beams, and does not care about the fabric price calculation. A weaving course in school should use simplified mode. – Normal mode is the default for ArahWeave Personal Edition or Pro versions. It has all the functions, to which you have been accustomed. – Expert mode offers some exotic, potentially dangerous functions, should be used for those, who know what they are doing. One such function in this mode allows users to convert jacquard cards into fabric files by using loom layout. Or converting all the weaves from BMP, TIFF, GIF… to Arahne weave file format. – In Server mode, program’s GUI functions are blocked, and its functionality is triggered by XML files, created by the ERP system. User is free to switch the mode at any time, so we are not taking anything away from the users. In an ideal setup, we should allow users to decide the fate of each of over 1000 buttons and menus. Do you want to see it in your daily work, or you prefer to have it hidden. The only problem is, how do you decide, if you don’t know precisely what does it do? Who has the patience to go through whole interface and decide the visibility of each button? We started with an unusual comparison, so let’s end in that way as well. A European visitor to USA is sometimes puzzled by the flood of choices at restaurants, for example at SUBWAY®: What kind of bread, what shape of bread, which pieces of salad, vegetables, meat, cheese, which toppings… One would prefer a simple “panino”, your best bread with a slice of mozzarella and tomato, give it a fancy name like “Capri”, and that’s it. Someone with good taste makes all the choices for you, and offers you a small choice of well rounded products. This is what we have tried to accomplish with program modes in ArahWeave. If there are functions you would like us to hide or show in particular mode, tell us about it. We are eager to please .